As a college guy, I believed in being different and outperforming the best of my lot. Coming from a modest family background, the realization of achievement dawned over me. I never favored being a 9 to 5 corporate professional and a having a ‘boss’ was simply not my cup of coffee. I was never interested in the classes held in the college because I was being more productive at the ‘reality’ front of the life. I envisioned getting involved in tasks that were strongest at the core. Computer technology was in its nascent state in India the time I started my tryst with web pages. I began with designing my own college’s alumni website while pursuing MCA at Banaras Hindu University, Varanasi. Eventually, I was assigned the task of the event websites too. I was happy because all this brought about a sense of power to me. Though not initially refine, my work still appealed to many and it also made me realize the power technology had. The very first seed of the idea of taking this up as a serious profession was sown by a friend who told me about how creating web pages and blogging could be a source of monetization. Google pages was my first shot as a techie, wherein I started with contributing content through blogs to several clients. I can still recollect the time I received my first pay cheque. Initially, I had tested all Content management systems and had started with Joomla and Drupal. With absolutely no knowledge about coding, I went forward to scale the web designing mountain. WordPress came and was well recognized as a blogging platform; suitable to what I worked on. I bumped into WordPress in 2009 and like many other users, utilized it for my blogging endeavors. Little did I know that someday it would be the answer to my ‘coding gap’. I remember working on a 6-month project for my MCA final where I took up WordPress as the core subject and in there I talked about custom plugins and themes. The teacher was happy to receive the unique project and awarded me good grades for my sense of initiation with new approach. Now, I knew how I had to take this WordPress awesomeness forward. With a little exposure to learning new technology, I was baffled for a while but had the will to scale this one too. 6 months, and I thoroughly decoded the WordPress codex for me. This was a giant step forward where my future lay in my own hands. Personally, I feel that WordPress does not constrict you to a certain limit or a line of functionalities. If you have a core foundation, you can toy with it and make awesome end results. WordPress was now my pillar of strength. 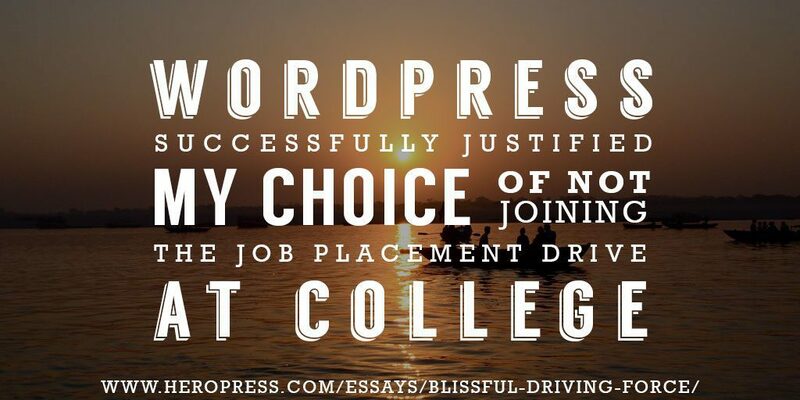 WordPress successfully justified my choice of not joining the job placement drive at the college. Now was the time to materialize my skills and have a material turnaround for the work I was capable of doing. After a 4-month hunt for some serious web designing projects with not a single task at hand, disappointment gripped me. The lack of proper work infrastructure due to poor Internet connectivity and local electricity supply were some of the other reasons I had to plan withdrawing my resources from Varanasi. I could have fallen or would have made a leap; it was about to be my choice for the rest of my life. It was frustrating because Varanasi had been my abode for 7 good years and leaving the place was a huge decision to make. I mustered up my wits to start afresh by withdrawing my base from Varanasi and shifted to Lucknow, India in order to try out seeking new opportunities yet again. The work stars favored me and with the help of elance-oDesk (now, Upwork) and other freelancing platforms, I received many life-changing projects of my life. Things moved forward and with many clients in a row, another year went by. I collaborated with more people who were willing to join me on the platform – people who wanted to leave a mark; never to look back. What remained constant throughout these years was my capability to work hard each day. I upfront admire WordPress because it has been a driving force for my existence. Time has moved slowly and with 6+ years of experience and self-discovery, I now run a fully-fledged WordPress based company Wbcom Designs that has many developers and freelancers onboard with me. While additionally serving BuddyBoss as a Product and Support Manager, now I plan to infuse new changes in the pattern we operate at base as well as the firm through strategic planning. It’s time to give back to the WordPress community through the development of free plugins, theme customization and spreading the WordPress fandom at local level. I recently took the opportunity to sponsor ‘Nashik WordCamp’ 2016, WordCamp Pune 2017, WordCamp Udaipur 2017, and WordCamp Kochi 2017. I am glad I was able to take a step forward in my plans to pay back to the WordPress community. To set the ball rolling at local level, I have recently come up with a local MeetUp group at Lucknow, India so that locally organized, face to face events can be organized that will accelerate the understanding of the WordPress CMS among the masses. I also plan to bring about WordPress awareness at the school and college level in my zone so that more and more young people know why this CMS is so amazing. To this day, my first love is my work desk. Whenever in an emotional or professional fix, I seek recluse through this amazing platform. Unlike others, working destresses me. There is a long way to go with this ideal because I want people to know how powerfully stable the WordPress is. I want to see the developer community going for heights that have never been achieved before and I want to be a part of this huge step-up. I am all open up for this WordPress community for contribution and assistance. For WordPress enthusiasts, I want to tell them that sky is not the limit. WordPress has accepted me as its own and it’s time for me and others to give back in the best possible manner. The post A Blissful Driving Force appeared first on HeroPress.